Bonjour Print-It's no secret that aspects of Parisian style make their way into many a wardrobe, mine included. This print showcases the best of those, from breton tees to the iconic Chanel perfumes. It's not too touristy and would make a gorgeous gift for the girl who loves Paris. Evie Kemp 'The Mystic Kitty' Print-Evie's gorgeous prints have been favourites of mine for a while. I actually have one of her floral cat decals on my wall at the moment. Her series of mystic cats have often taken my fancy and if I'd won the lottery I would purchase them all. As that is not the case, and I had to choose just one I'd go for this cat. I love it! There's not much else to say here really. Severus Snape Print-Harry Potter fans will recognise this quote and know it's from one of the most heart-wrenching moments in the entire series. The context behind this quote is what attracts me to this print but it is also one of my favourite scenes in the final film. I've also seen a rather rad HP print with motifs in the shape of Harry's scar but I couldn't find it online. 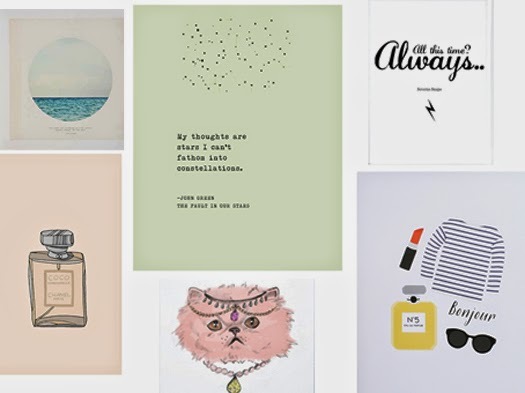 Tina Crespo Salt Water Cure Art Print-Oh Urban Outfitters, it's probably a good thing you don't exist in New Zealand. Your clothing and homeware departments would leave me broke. This actually reminds me of a photo I've taken of the sea in Napier a few years back. Maybe that's why it's so appealing. Again I love the simplicity of this one. The Fault In Our Stars Typography Poster-I've actually gone ahead and purchased this print already but it was too gorgeous not to include. The shipping to New Zealand was a bit steep, but this was my favourite quote from the book and I knew I'd regret not ordering it. I love the pastel hue and the general simplicity of this print. Chanel Mademoiselle Print, similar here-If you've been around these parts for a while, you'll know that Coco Mademoiselle was my signature scent back in the day. This print is from the lovely Emmakisstina's Etsy store. She does the most gorgeous fashion and beauty themed drawings. This print is currently not listed in her shop but there are other perfume designs available. Check out the Charlotte Olympia cat flats too. They're so cute! *What's on your decor wishlist? You should definitely check out Society 6!